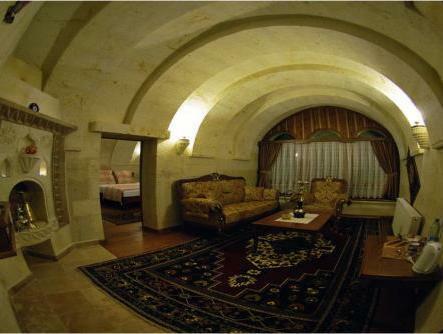 ﻿ Stone House Cave Hotel Goreme. JIMAT di Agoda.com! Dengan lokasi mudah di Goreme, Stone House Cave Hotel adalah tempat yang hebat untuk menjelajahi bandar yang menarik ini. Dari sini, tetamu boleh menikmati akses mudah kepada semua yang bandar meriah ini boleh tawarkan. Untuk pilihan bersiar-siar dan tempat daya tarikan tempatan, pelancong tidak perlu pergi jauh dari hotel kerana ianya berdekatan dengan Istana Roman, Yama Tours, Heritage Travel. 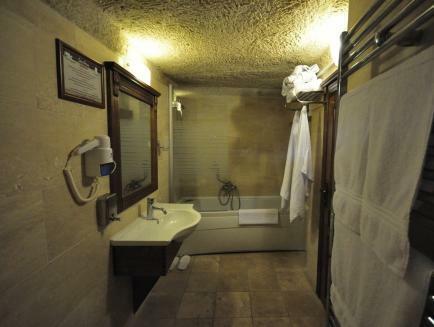 Di Stone House Cave Hotel, perkhidmatan yang cemerlang dan kemudahan yang unggul menjadikan penginapan anda tidak dapat dilupakan. Hotel ini menawarkan meja penyambut tetamu 24-jam, kemudahan bagi tetamu kurang upaya, daftar masuk/daftar keluar ekspres, simpanan bagasi, parkir valet untuk memastikan tetamu menikmati keselesaan yang terbaik. Semua penginapan bagi tetamu menawarkan kemudahan yang difikirkan dengan teliti bagi memastikan rasa selesa yang sukar ditandingi. Hotel ini menawarkan kemudahan hebat, termasuk tab panas, menunggang kuda, untuk membantu anda berehat selepas hari yang penuh aksi di bandar. Stone House Cave Hotel merupakan tempat yang ideal bagi penginapan pelancong yang mencari keindahan, keselesaan dan kemudahan di Goreme. Guests can get 10% discount in the à la carte restaurant during their stay. We very much enjoyed our stay here. The staff at the front desk were extremely helpful. They helped us book tours and rides to and from the airport, without being pushy or intrusive. Our room was very modern and super spacious! We really loved the feeling of being in a real cave hotel. The breakfast buffet was the best we had in Turkey. Loads of options for traditional Turkish and Western preferences. There are several rooftop terraces with nice views of beautiful Goreme. The location was also great as it was right near all shops and restaurants but also quite quiet. I would definitely stay here again. The room looks nice and spacious but the air conditioner is sooooo noisy. The place wasn't that bad. However we found a few issues. We found that our room was really warm at night and there was no aircon. Also, the toilet door didn't close properly sometimes and one of the cups were sticky with something on it when we wanted to have coffee. The breakfast was limited so we were skeptical on the dinner even though they offered 10 percent discount. The staff was alittle unfriendly especially during the night shift. All in all, it doesn't deserve the rating given that this is a 4 star hotel. Will probably rate this 7 or 8. We booked 2 nights and the hotel staff have always been very helpful in providing us options and directions around the town. They helped us in local transportation as well as trip booking. 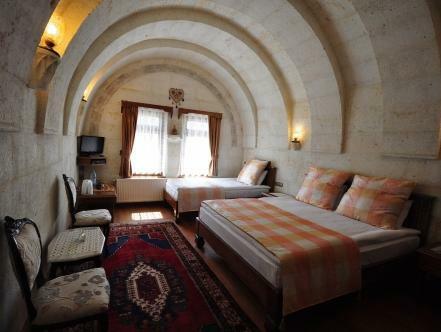 The hotel doesn't have many rooms but the room we stayed decorated in traditional Turkish style with a warm home feel. We enjoyed the stay. The only thing to note that the water is supplied from boiler so it could start very hot and turn warm. Better check if to take shower in winter. We stayed for 2 nights. The most remarkabe point of this hotel is staff hospitality. One of the staff speak English very fluently and gave us many useful information. We arrived at this hotel at around 08:30 PM. He arranged us for the next day's balloon tour after introduced us several Ballon company and their merit and demerit. He told me that there are other ballon companys which price are cheaper in town that they don't arrnage and he didn't urge us to book by him.So we trusted him and Ballon Tour was excellent.He can arrnanged us for other Tour and Taxi by very cheaper price mentioned in my guide book. 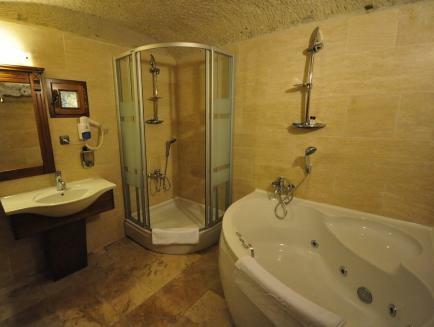 Room is spacious and equiped good jacuzzi. I recomend this hotel!